Now that Yoselin has moved in, I felt it was time to upgrade my bed from my childhood bunk (no joke) to a legitimate grown-up bed. I didn’t want anything used, off of Craigslist or the street. In addition to most of it being junk, getting something used provides extremely limited selection, and I wanted something more personal and just the way I envisioned – sturdy, good-looking, classic, low-profile. IKEA is trendy, but the lower-end stuff is cheap plywood or particle board and the actual hardwood furniture is overpriced for what it is. In either case, none of it is really designed to be long-lasting, heirloom-quality workmanship. But furniture that IS heirloom quality is super expensive! 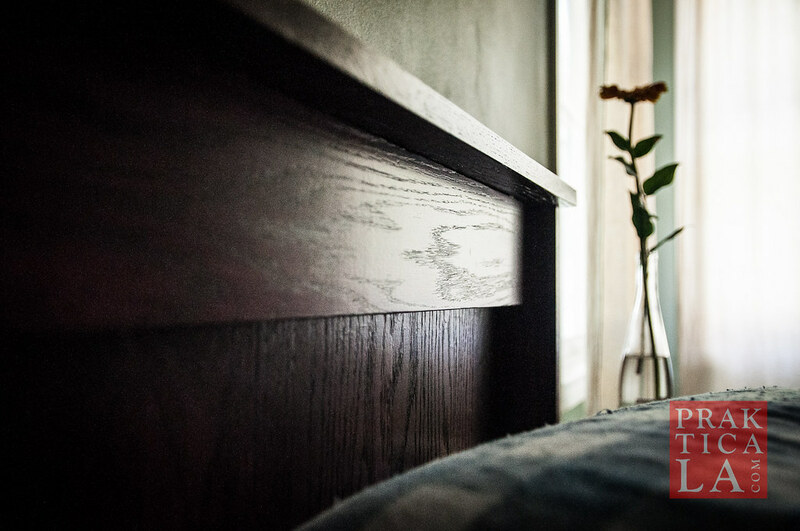 Any bed made from solid oak will easily cost close to a thousand dollars (or more). What is a budget-conscious weekend warrior to do? Easy question – build your own! I constructed the frame out of solid oak – other woods are cheaper, like pine or poplar, but oak is the go-to wood for high-quality, long-lasting, great-looking furniture, and I plan to use this bed until the cows come home! Being the first bed I have ever built, it was challenging project, and I’ll give more details for the “how-to” at a later time. (EDIT: Instructions are now available!) For now, let’s get back to the mattress. As mentioned in my earlier post, I wanted to switch to foam after decades of being on a squeaky, lumpy, innerspring mattress. Springs are ancient bed technology. They wear out unevenly, make noise, and transfer movement annoyingly. Foam, on the other hand, is cutting edge shiz; nowadays the higher-end material is pretty much space-age, balancing softness and support, minimizing movement transfer, super quiet and inert, and long-lasting. Price. Even though Casper and Leesa both have coupon codes to reduce their prices by a few bucks, Tuft and Needle is still significantly less expensive. The queen size Tuft and Needle mattress is $600 shipped free, while Casper’s equivalent is $850 and and Leesa’s is $890. That’s a big difference, especially for the budget-conscious newlywed! Firmness. 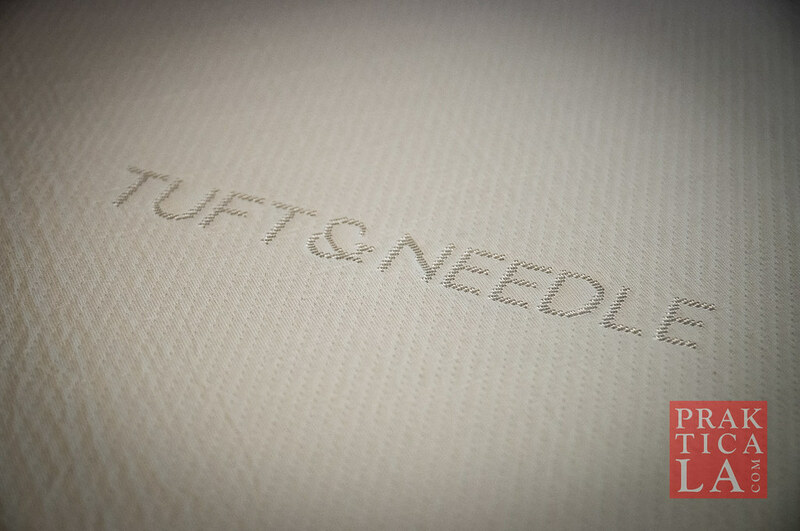 Many reviews have stated that among the three, Tuft and Needle’s mattress is the most firm. Casper’s is usually reviewed as the softest of the three and Leesa’s is somewhere in between. Yoselin and I wanted to move towards a firmer mattress for more back support. Eventually we want to move up to the traditional Japanese style of sleeping on a stark, wooden board. Just kidding. They must use some kind of industrial press to squeeze the mattress in there, because once the box is open and the plastic wrap is carefully removed, the mattress begins to “inflate” rapidly. 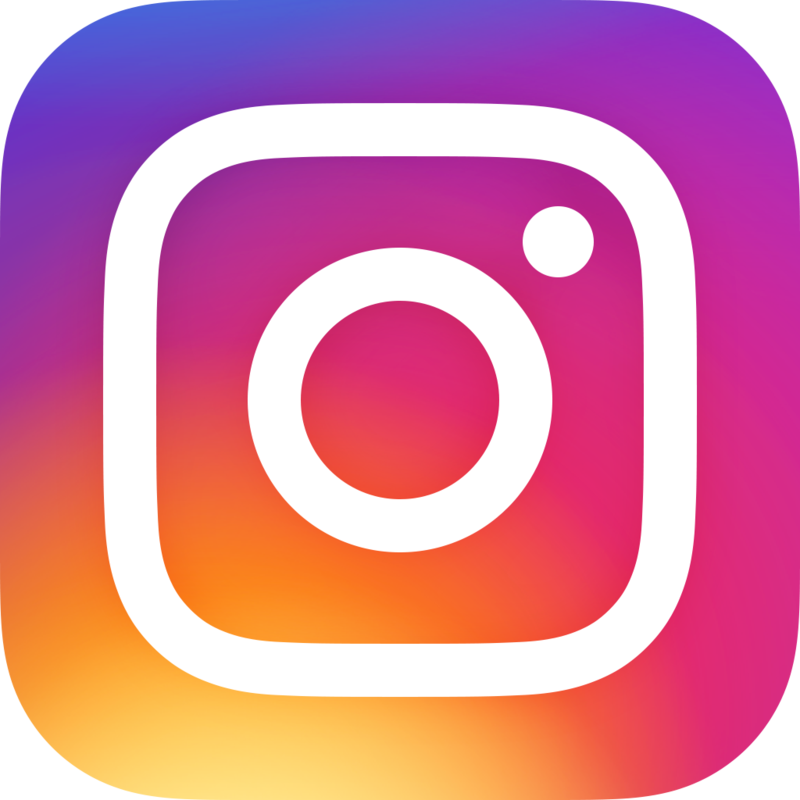 In a few minutes, it looks like a regular, full-sized mattress, although the directions suggest waiting 2-3 hours before use in order to let it fully expand. The mattress looks good. Really clean and simple. OK, so the reason the room is a mess is that I had a lot of junk stored under my old bed. In order to move the new bed in, I had to shove all that junk aside (to be sorted out later), which is why it’s all piled up to the sides. The mattress is indeed firm. Probably firmer than you are thinking. At the same time, the top layer has a reasonable amount of “give” so that it still seems kind of plush. I think this might be because the top foam layer is softer and the lower layer is more rigid. In any case, the foam does NOT display the “memory” effect like typical memory foam does. People used to dig this effect, but when you think about it, it feels a little like quicksand, and makes it hard to move around. The Tuft and Needle mattress has quite a bit more “bounce” to it and lets you move around easily. 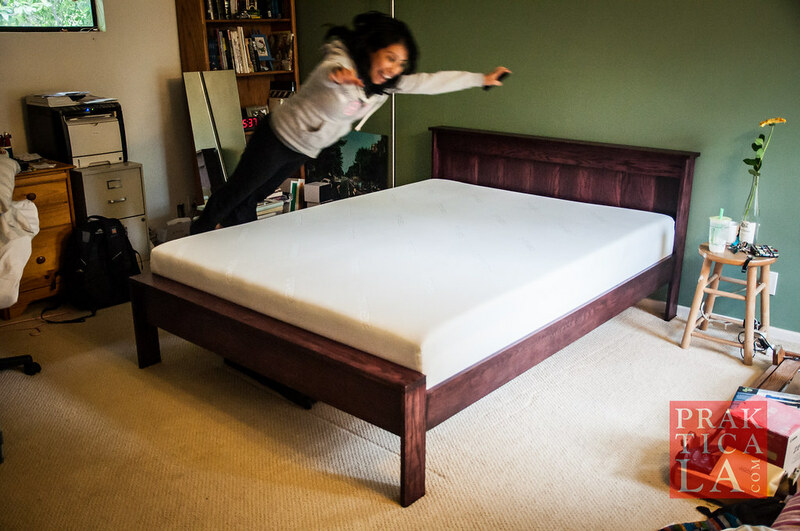 Another cool thing that is that movement does not transfer across the mattress. If you push down on one side, the other side remains more or less static. So if one person tosses and turns, or gets into bed later than the other, the other sleeper won’t be disturbed. Perfect for when I sneak into bed at 3am after a long night of hard partying! 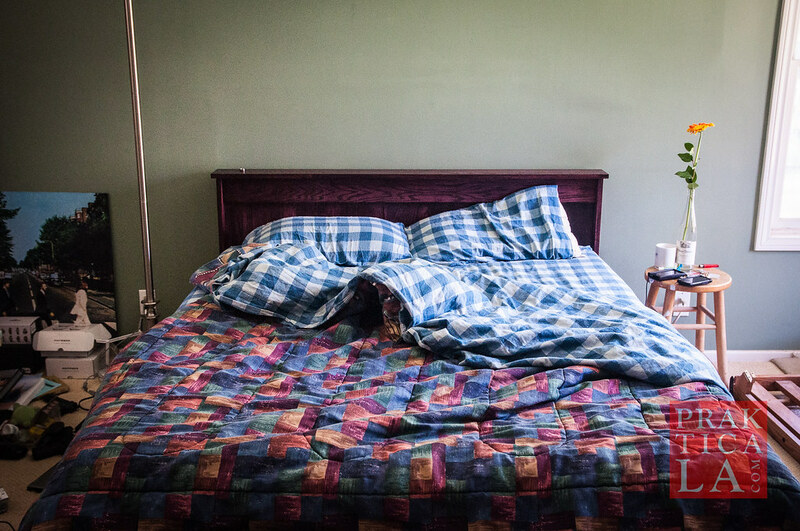 To be honest, the first night took a little getting used to – maybe because I am accustomed to my usual mushy innerspring mattress from the olden days (aka the 90s). By the second night, I felt super comfortable. It reminds me of the new “hotel” feel that people love. 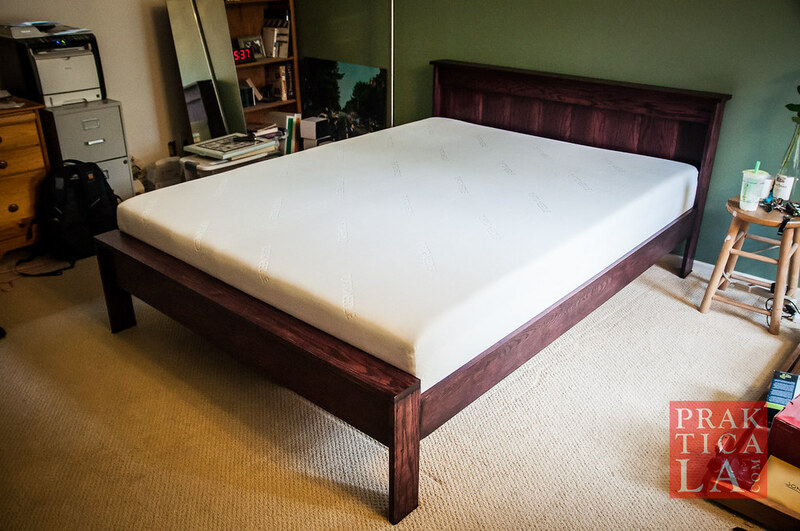 I really like how the mattress doesn’t simply collapse under you, like cheaper foam does, but actually provides a stiff platform to support your back, regardless of your sleeping position. And like I said, the top layer sinks just the right amount to still make it feel “soft.” It is hard to describe because it isn’t like any other mattress I’ve been on; you sort of have to feel it for yourself. EDIT: Tuft and Needle’s trial period is now 100 days, the same as Casper’s and Leesa’s. All three mattresses offer a 10 year warranty that guarantees against defects, loss of firmness, etc., and all three are made in the USA. Very cool. I always appreciate companies who keep production in the States. Tuft and Needle also has 5-inch mattresses available for more compact beds and futons. They can also be purchased at the Amazon link. Bottom line: If you are on a tight budget or if you like your mattresses more on the firm side, I recommend the Tuft and Needle. If you like more “hug” from your mattress, maybe give Casper a try first because theirs is supposed to be the softest. If you like being fancy and drink you tea with pinky extended, give Leesa a shot. Just kidding. All three have great reviews; I think it comes down to your personal preference and budget. You can get the Tuft and Needle mattress in several sizes, as well as read all the reviews, at Amazon. Check it out. Anyone else have experience with this mattress or any of the others I mentioned? Let us know in the comments below! 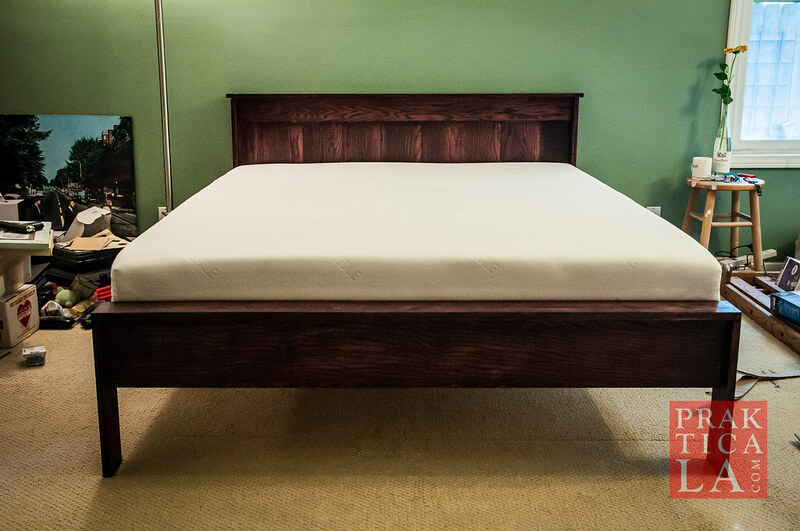 EDIT: We now have another review for very different but also great mattress from Amerisleep! If you are more particular about the firmness/plushness of your mattress, you’ll want to check it out. 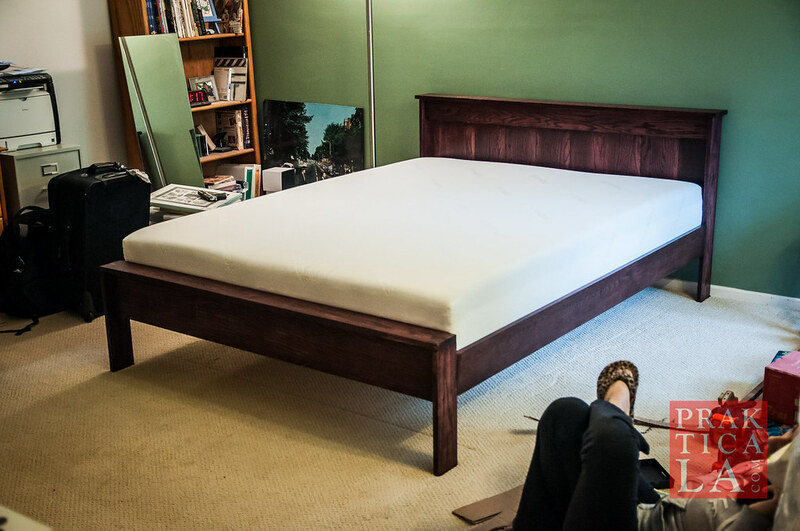 Additionally, if you are interested in building your own bed frame like this one, click here! Would love to see your bed build diy instructions. The bed looks beautiful! Thanks for the comment, Jen! I’d love to put those up too! Hopefully I can get around to it. I second the diy bed frame instructions, or at least more photos so I can figure it out. Good project! OK, this is definitely on my radar!